CanadaVet.com is having a ridiculous sale on all Revolution 6 and 12 packs for Cats and Dogs! 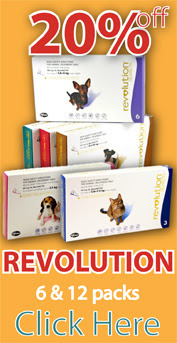 Receive 20% off all Revolution 6 and 12 packs for your pet, when you rush to CanadaVet.com now! Revolution for Cats 12pk was $209.42, now $167.54! Revolution for Cats 6pk was $105.71, now $84.57! Revolution for Large Dogs 12pk was $209.42, now $167.54! Revolution for Very Small Dogs 12pk was $173.82, now $139.06! Race to CanadaVet.com now because these discounted prices are available for a limited time only!